GF Homemade Playdough: Worthy of Play or DOH! ? What a fun day! At the request of my daughter I found then made two gluten free playdough recipes that I found on the web to see which one, if any, are worth the bother. 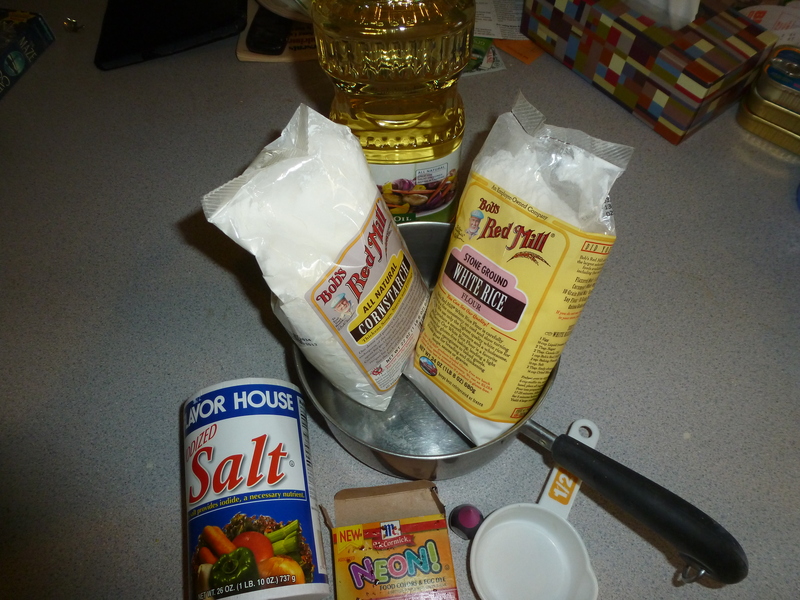 Mix ingredients in medium sized saucepan. Cook and stir on low heat until it forms a ball. Cool completely before storing it in a seal-able plastic bag. I made the mistake of doing this on a day when the arthritis in my hands was acting up. It hurt to stir the dough in the pan. If you have a similar issue either wait for a less painful day or have someone (an older grand?) stir it for you. This is where my hands started hurting. It gets very sticky. This recipe required some tweaking on my part to make it playable. After in cooked as much as it could before my hands gave out, the dough was still too sticky to use. I kneaded the warm dough in some cornstarch I put out on the counter; the warmth felt good on my hands. Recipe 2: I remember making this when I was a kid. The recipe came from the cornstarch box. I found this in my search for GF playdough recipes. Mix ingredients in saucepan over low heat. 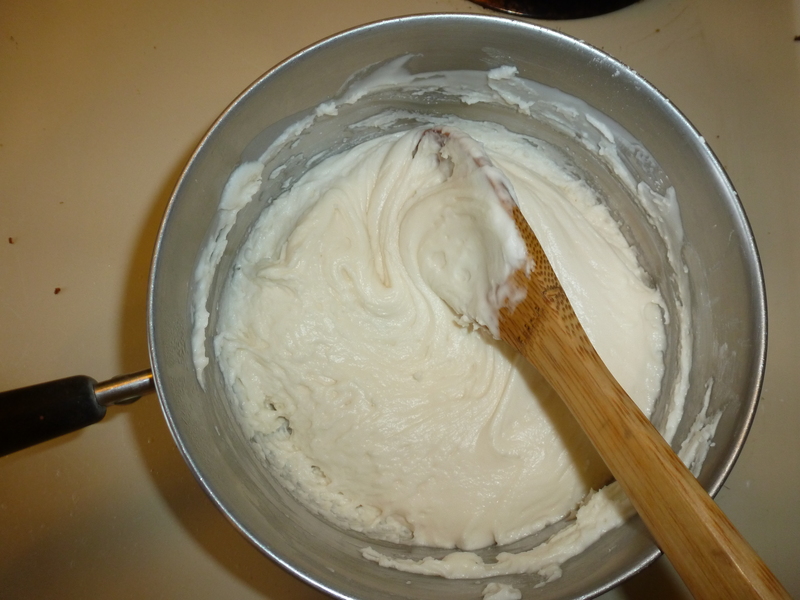 Stir until mixture become very thick. Mix in liquid watercolor or food coloring if desired. Remove from heat, knead until smooth. Store in Ziploc bag in refrigerator for up to a month. I let it cook just a little while longer from this point. 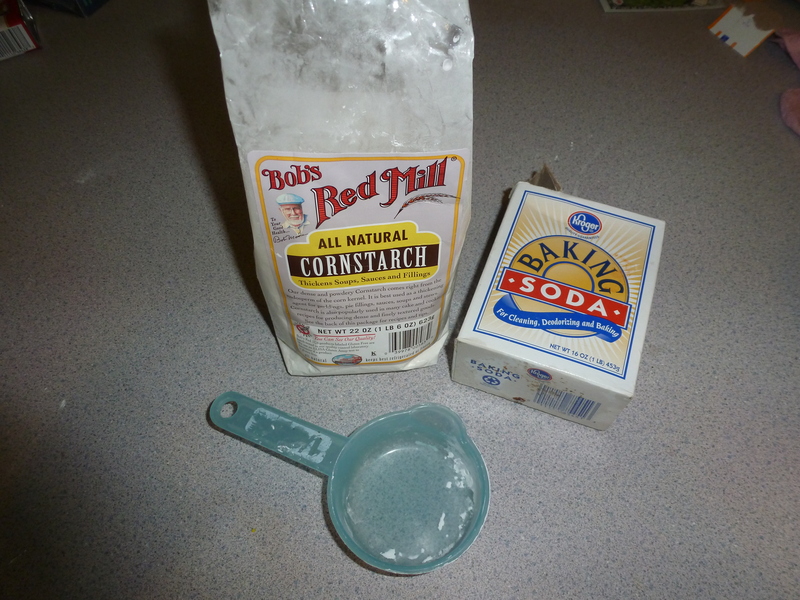 I did not need to add cornstarch when this was finished. The texture was nice and it was not too sticky. 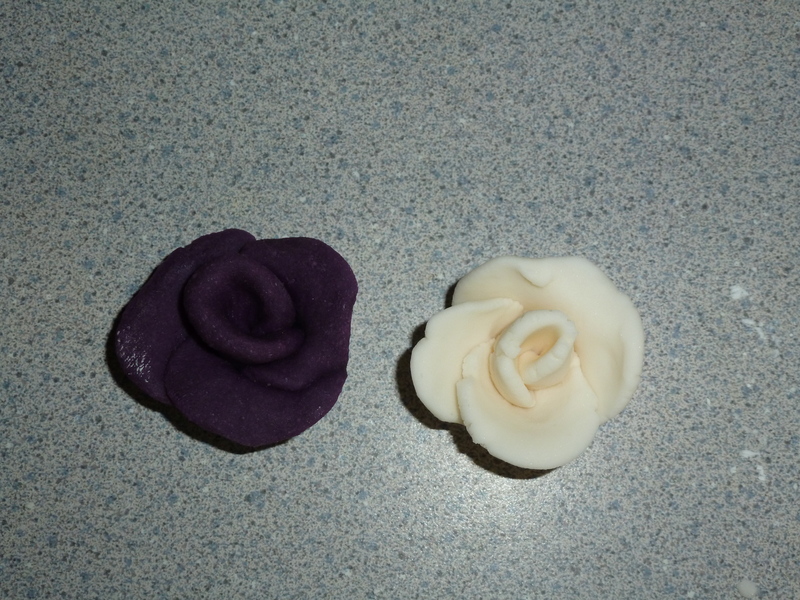 I made small roses from each kind of dough to see which one I liked better. 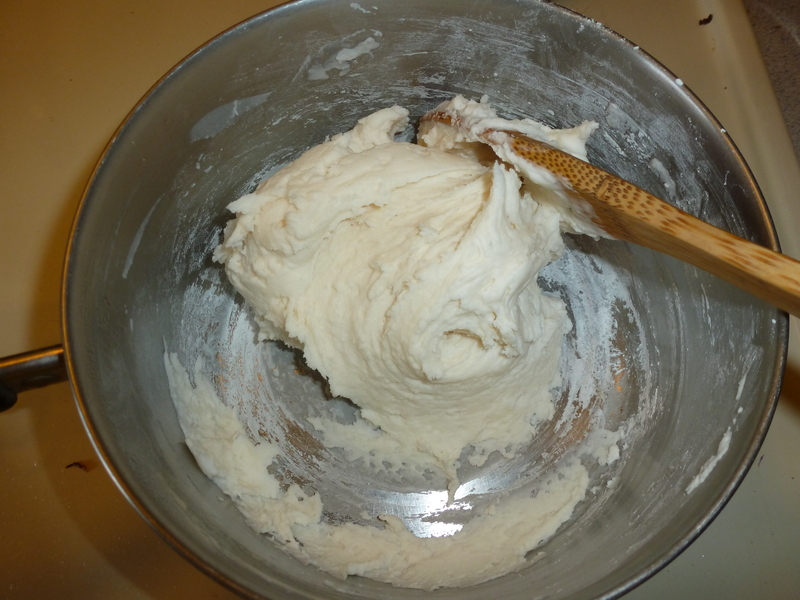 I needed to dip my fingers in water to work with the cornstarch (recipe 2) dough because it started to dry quickly. Recipe 1 has a grittier texture. It feels and works more like conventional playdough. Recipe 2 is smooth as silk. You can do finer work with Recipe 2. I’m not sure how important that is for young kids but older kids might prefer it. I know the artist in me prefers Recipe 2 but the Grandma in me thinks Recipe 1 is better for younger children. I had fun playing today. I can’t wait to find some kids to use the playdough with. 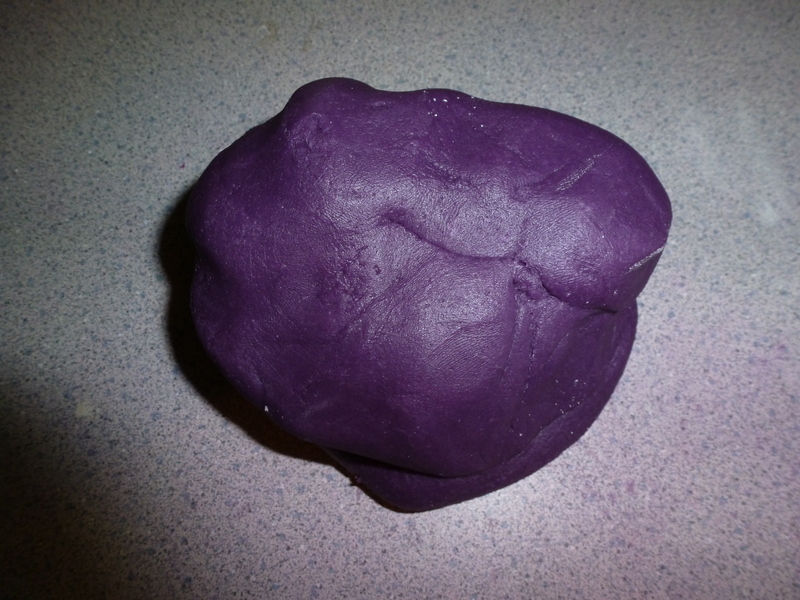 Here’s a challange, make the playdough for yourself! It’s a blast letting the creative, unassuming child out to play. You will understand better the delight your grands and or children feel when they get their hands in this wonderful squishy stuff. 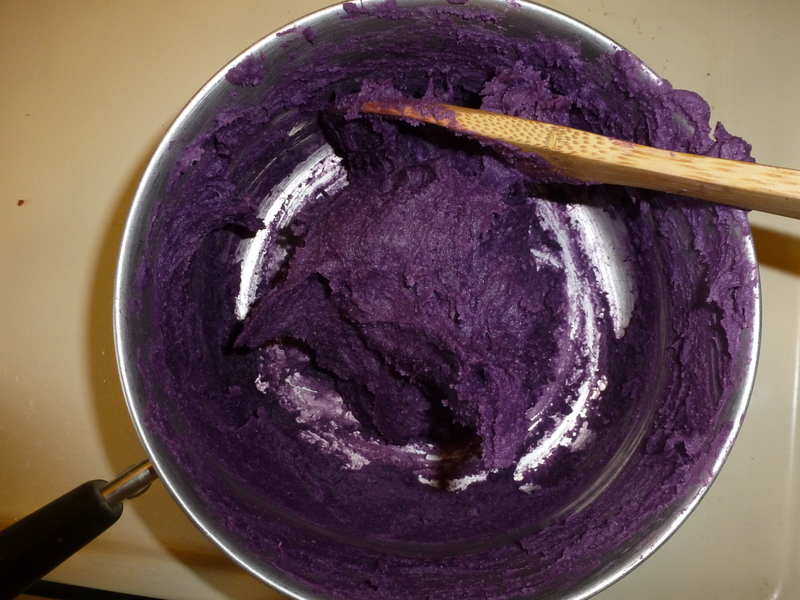 Gluten free play-dough! How great is this? I have updates to this blog. I kept the play dough to see how long it stayed playable. I kept them in ziploc type sandwich bags in my studio. 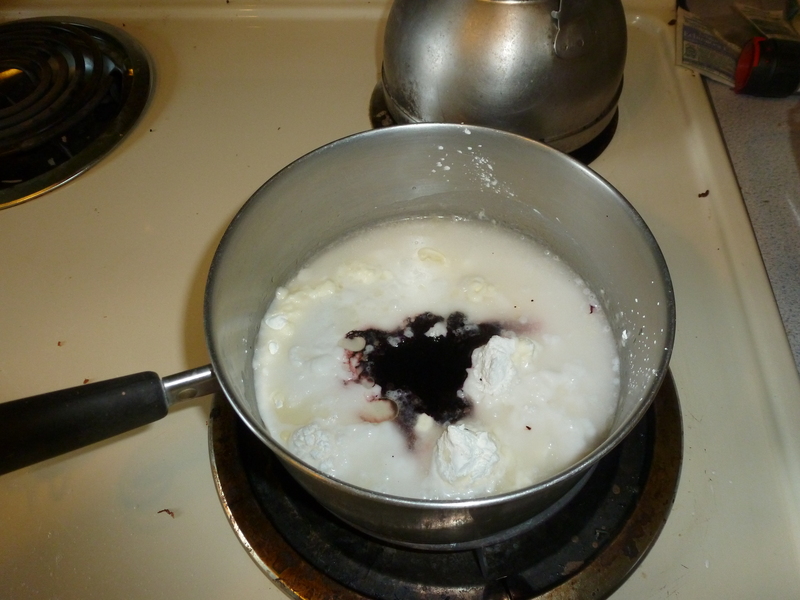 Well, after 2 weeks the purple rice flour recipe started to get slimy, then the dogs got it and that was the end of that. The cornstarch and baking soda batch, however did not start to go bad until last week. Before it went bad I used it for a mixed media paining. The texture was smooth and silky, however, I had to keep dipping my fingers in water to work with it because it tended to be on the dry side. I will post photos of the painting soon and you can be the judge of how well the clay looks. Enjoy!